Txchnologist: Why Are Electric Car Demonstrations So Boring? The New York Auto Show, which opened to the public on Saturday, has elicited some barely stifled yawns from the automotive press. The slightly tweaked top-selling Toyota Camry and the Nissan Altima, conservatively styled to defend its No. 2 position, just don’t get the pulse racing like the showpieces of yesteryear. But far and away the most boring exhibition – the full Ambien, if you will – was tucked away in a corner of the bottom floor of the Javits Center’s showrooms. That’s where the electric cars at the EV Pavilion slowly and soundlessly lulled auto lovers to sleep doing laps around a partitioned-off track. In a piece of art direction that can only be described as self-sabotaging, the interior of the track was lined with a white picket fence and an Astroturf lawn. It was hard to guess the exact purpose of the EV Pavilion, beyond showing attendees that plug-in electric cars can do laps of the world’s ugliest suburb at 5 miles per hour. Or maybe the intent was to make Jeep’s outdoor “Awesomeness Pavilion,” AKA the ”Camp Jeep Outdoor Off Roading Ride Along,” seem that much more awesome. 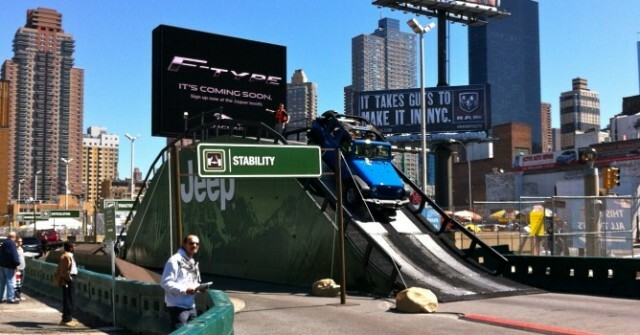 The stunt drivers in the four-door Wrangler Unlimited Rubicon took thrilled participants through a series of obstacles that threatened to roll the vehicle, bog it down hopelessly in a simulacrum of quicksand or send the vehicle tumbling end over end down an 18-foot slope better suited to ski jumpers then cars. The Jeep Wrangler Unlimited is kind of like a rollercoaster you can yank off the rails and take home for $33,570. If you could have caught your breath after seeing this bravura performance, you might have asked, when did we get so good at solving problems that no one actually has? There are few places in America that even allow the kind of environmentally damaging driving at which the Jeep excels and these exhibitions are always particularly hilarious in Manhattan, the most engineered environment in history. The Jeep engineers and designers deserve praise for conceiving such a rugged vehicle and then turning it up to 11 (the soundtrack at the pavilion, by the way, was a masterpiece of arena jock jams mashed up with a compactness that would shame Madison Square Gardens’ PA operators) but, really, they’re marketing a smaller, more affordable Hummer. What problems should we be solving? Well, for starters, gas is expensive, dangerous to procure and China is going to steadily outbid us for it in the coming decades. So, we should improve our fleet fuel economy to 50-150 mpg. Also, our vehicles spew too many greenhouse gases into the atmosphere, so our cars should be cleaner. Truth be told, we already have solutions – imperfect ones, but solutions all the same – to these problems. They’re called electric vehicles. The real problem is that they’ve been shunted to the corner of sub-basement B, or, rather, automakers have put them there. Why aren’t electric cars out having nearly silent drag races on 11th Avenue? Why doesn’t GM create a demonstration Volt that can tackle a nearly vertical incline? It doesn’t matter if this rugged Volt would cost $250,000 to make and a regular Volt could never do that. I can’t stress this enough: Nobody drives like that. Electric cars need swagger. Right now, they have none. “America Hates Electric Cars," Joel Johnson proclaimed last January in Jalopnik, the official blog of America’s automotive id. I’m not going to disagree, even though some of the technical arguments were pretty specious. You know what America loves? Awesomeness. And awesomeness is an equal opportunity sport – as open to Nissan Leafs as it is to Jeep Wranglers. Somehow, that message got lost on the way to the EV Pavilion. Matthew Van Dusen is the editor in chief of Txchnologist. he was a reporter for ten years at newspapers in Wyoming, Indiana and New Jersey, where he covered health care, the government’s response to Hurricane Katrina in Mississippi and government corruption. He is the former co-editor of Green Energy Reporter. This article, written by Matthew Van Dusen, was repurposed with permission from Txchnologist.com, an online magazine presented by General Electric. High Gear Media's editors have edited the article to conform to this site's standard formats.